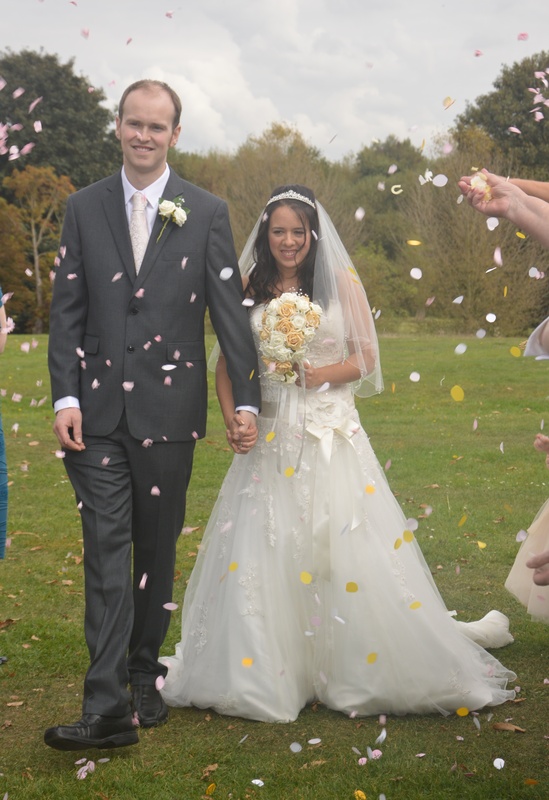 The last Saturday in September was my brother Rob and his fiancé Jade’s wedding day. It was a lovely sunny day and mild for the time of year. I chose to wear this oriental inspired dress from Oasis and paired it with black pointy shoes from New Look and a bag which complimented the pink as well as the black also from New Look. 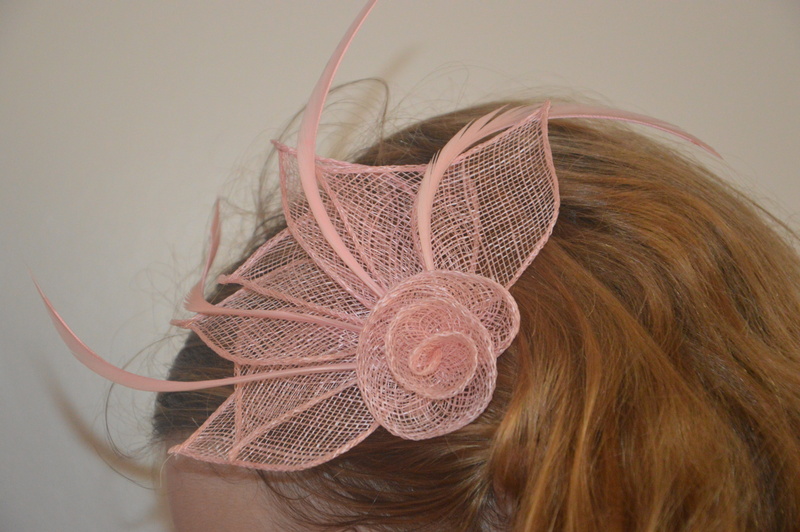 The look was finished off by a salmon pink fascinator. I co-ordinated my husband by dressing him with a matching salmon pink tie. 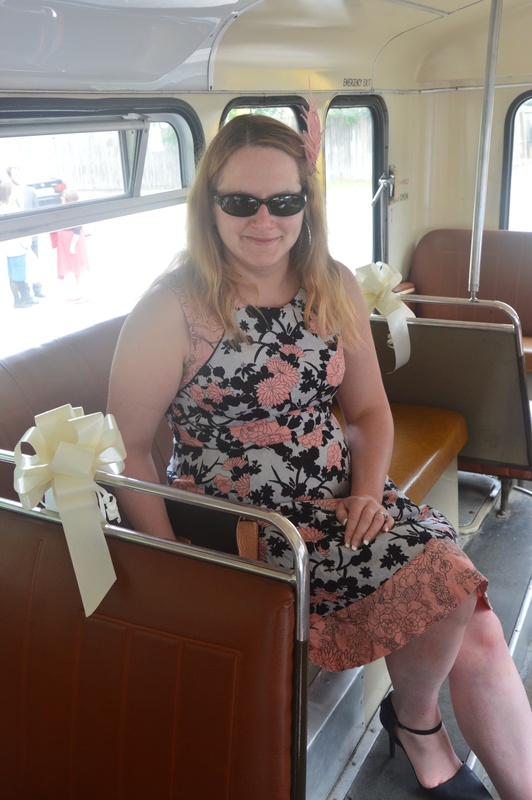 Guests were taken to the quaint church by a 1970’s double decked bus which a friend owned and drove and they had decorated up with white bows and a mr&mrs garland. The church itself, All Saints in Foots Cray dates from 1330, although there have been various modifications made since that date. It is a very pretty church with a nice meadow next to it where lots of the photos were taken. It was a church held dear by Jade as her maternal Grandparents were married there some 62 years ago – how lovely for them to see their Granddaughter married in the same church. The orders of service were handmade and matched the heart theme of the invitations. I loved the fact that their choice of hymns took me back to school assemblies with ‘Make me a Channel of your Peace’ and ‘Whole World in his Hands’. I read a piece from the bible and the second reading was a poem from Captain Corelli’s Mandolin and was the first nod of a Greek theme being that the film was set on the Greek island of Kefalonia. 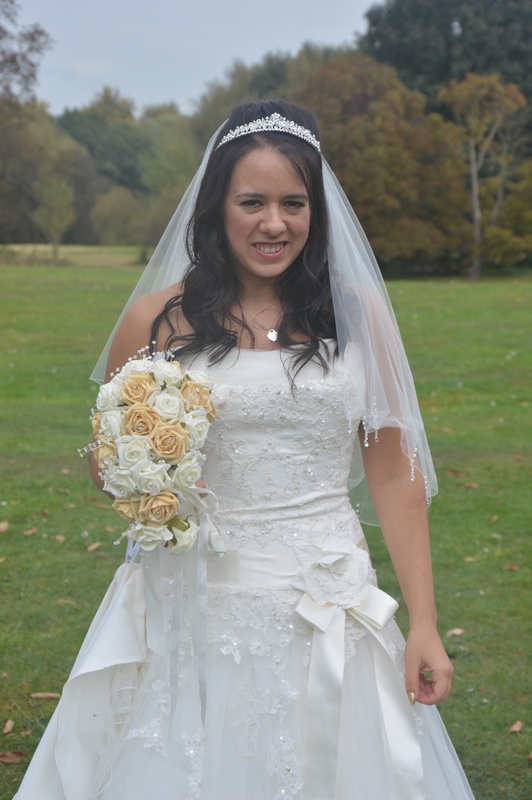 The bride and her father arrived in a lovely Bentley and she looked stunning in her dress which was a beaded top with sweetheart neckline and a beautiful bow around the middle. 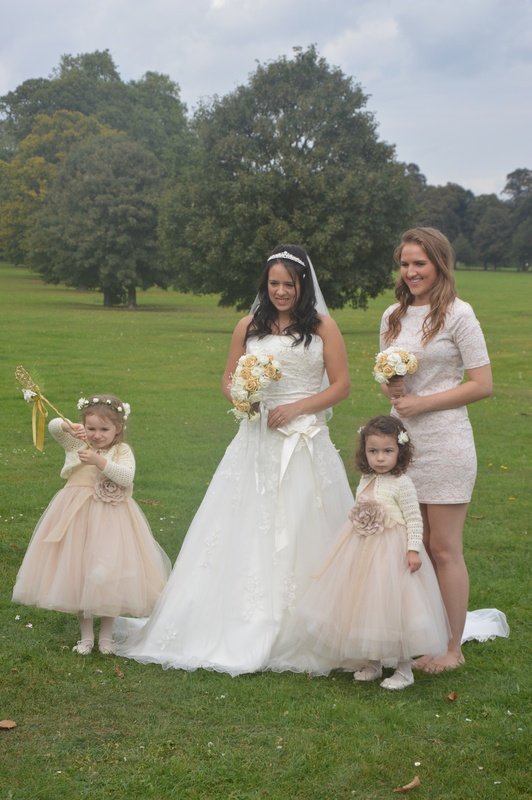 She was followed down the aisle by her cousin, a last minute stand in for Maid of Honour who unfortunately was ill and 2 wonderful flower girls – Jade and Rob’s 3 year old daughter and their niece who was 2. The 2 girls wore champagne dresses from BHS and little shrugs made by Jade’s Grandma. The flowers were champagne and white roses and were all artificial but you never would have guessed – they looked just as stunning as fresh flowers would. The men in the bridal party had gold patterned ties. Whilst Jade and Rob signed the register with their witnesses, my Mum’s brother sang ‘Ava Maria’, ‘All of Me’ and ‘How Long will you love me’. His performances were met with a round of applause, something he had not been expecting. 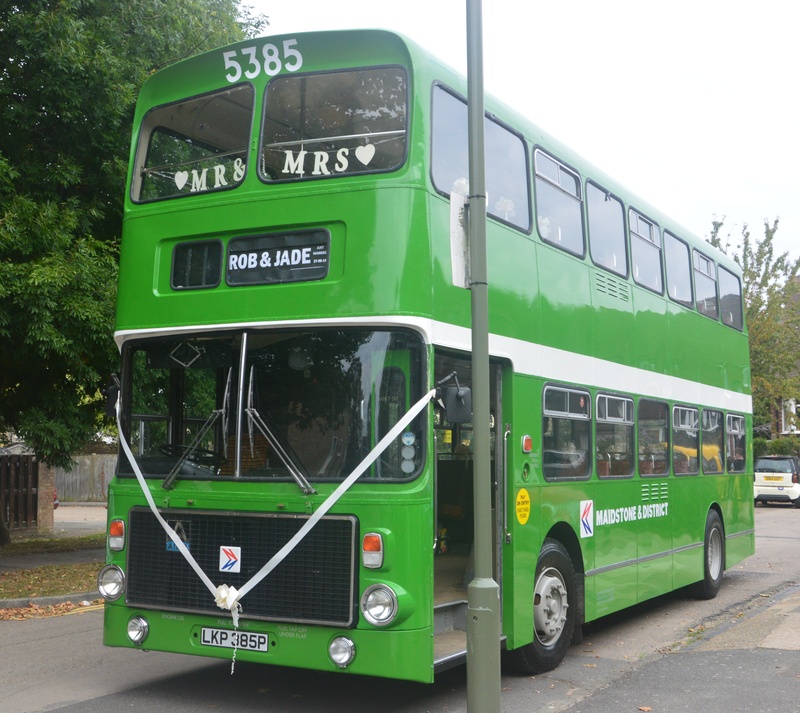 After the confetti and a number of photos, Jade and Rob joined their guests on the bus and we were driven to the reception at Shortlands golf club where we were welcomed with bucks fizz. Each table had been beautifully laid out and this was where the Greek theme started to shine. 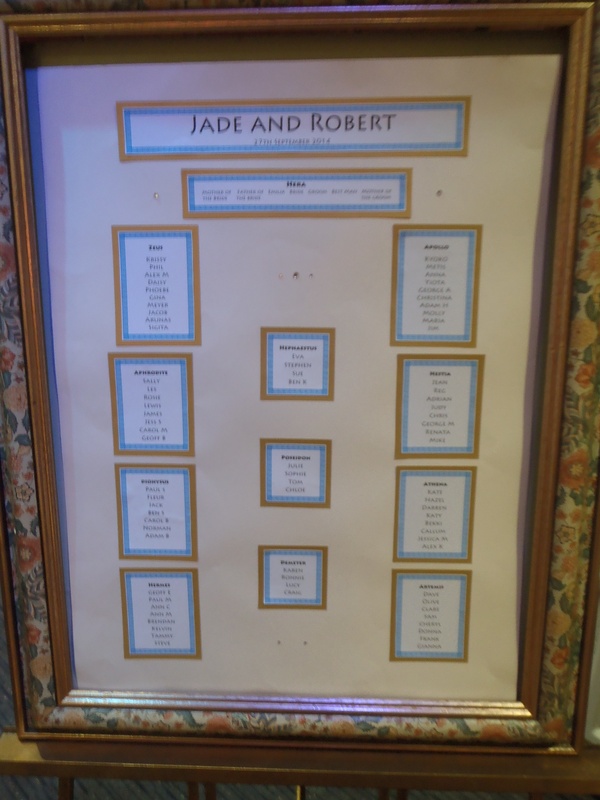 The table plan was handmade with a Greek style border around each table. 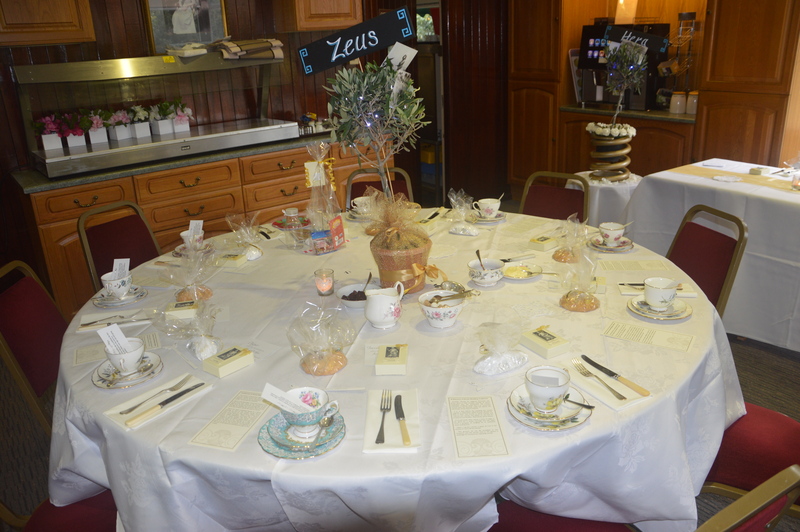 Each table had an olive tree as a centre piece with fairy lights twisted in them, a sign with the table name on and some old black and white photos of Cyprus. The tables were named after Greek Gods, we were sat on Zeus, the father of the Gods. The top table had a hint of my brother’s passion in it as the olive tree sat in a spring from a train that had been sprayed gold. 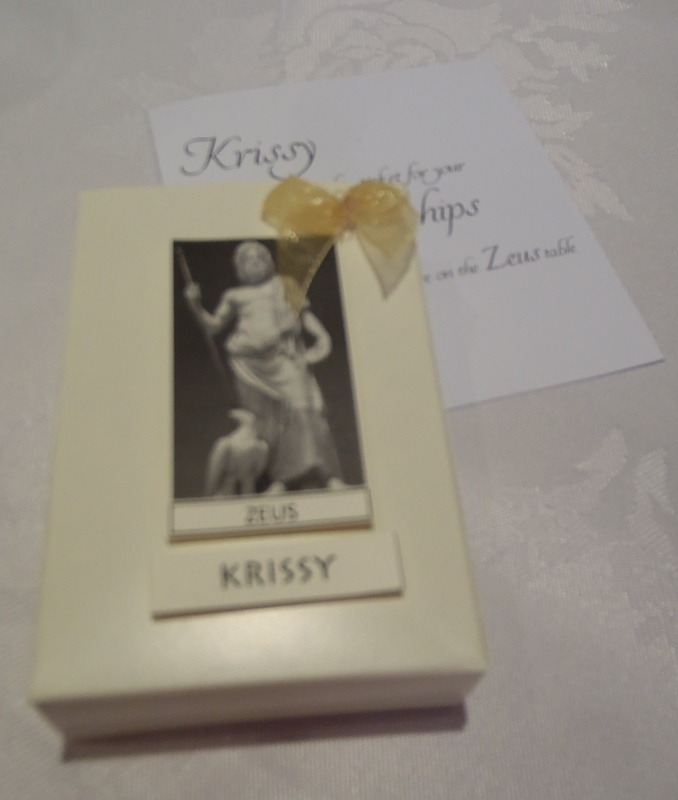 Favours were cream boxes which had your name and a picture of the God whose name adorned your table. Inside were 5 sugared almonds with the relevant meaning, a couple of other sweets and an old Cypriot coin. 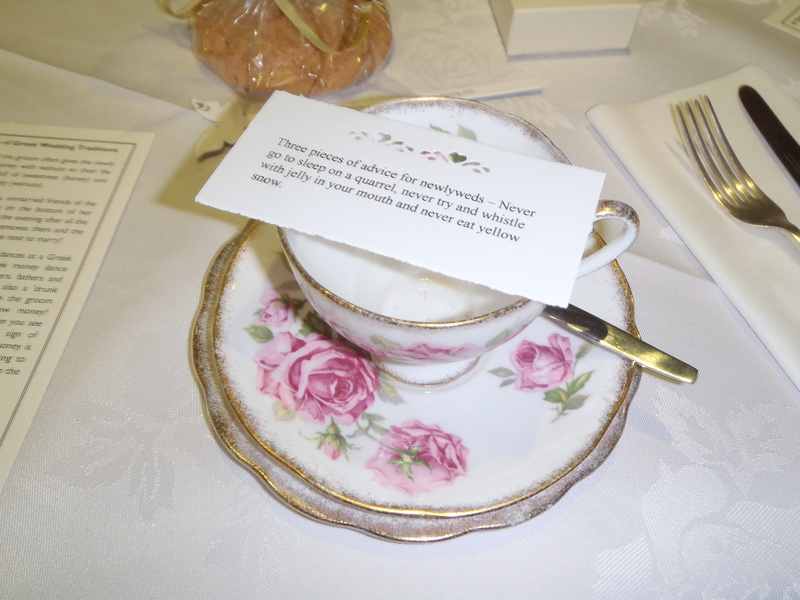 Also on the table were butterfly social stirrers (something to stir your tea or coffee with a conversation starter printed on it), a quote/fact about marriage e.g. ‘In the words of Groucho Marx, marriage is a wonderful institution but who wants to live in an institution.’ There was also a card describing some of the Greek traditions for a wedding. They had painstakingly cut out heart confetti from Greek newspaper which was sprinkled on the table– tying together both the heart theme and the Greek theme. 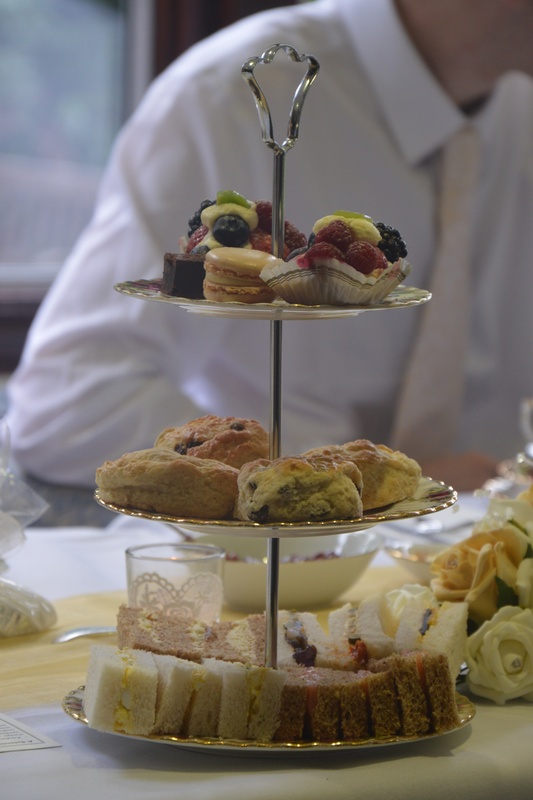 The sit down meal or wedding breakfast was a quintessentially English afternoon tea. 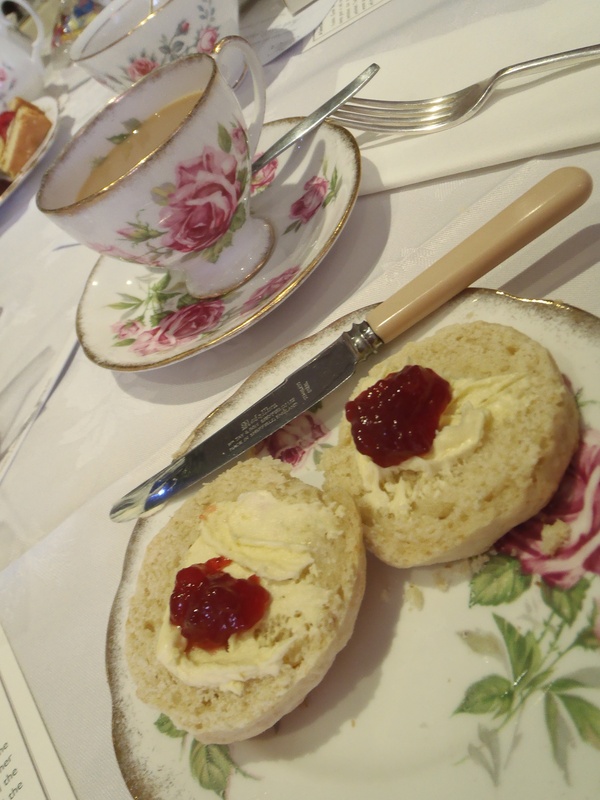 The company who did this supplied lovely vintage crockery as well as some vintage props and an old suitcase for any wedding cards. 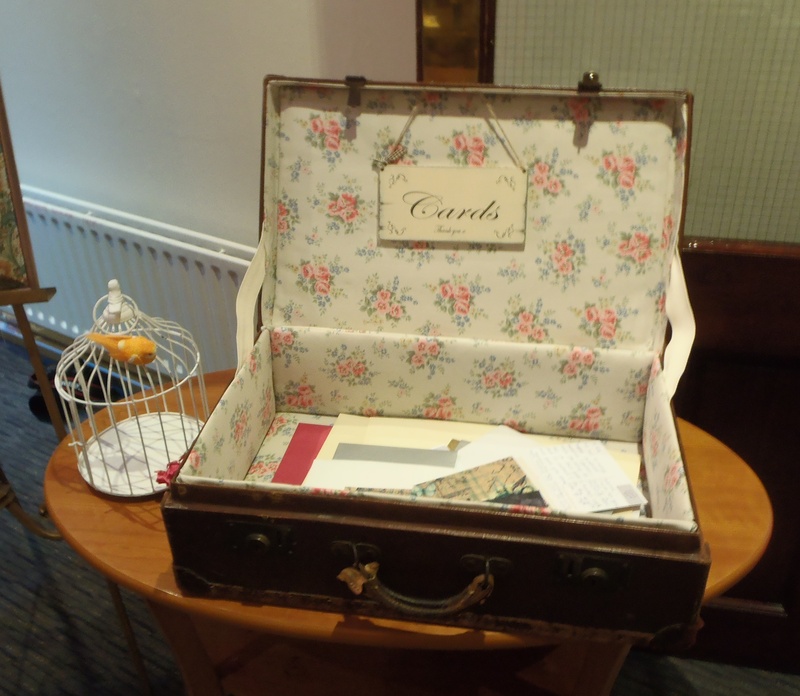 Postcards were handed out for guests to write some advice or a memory on for the couple – an alternative take on the guest book. 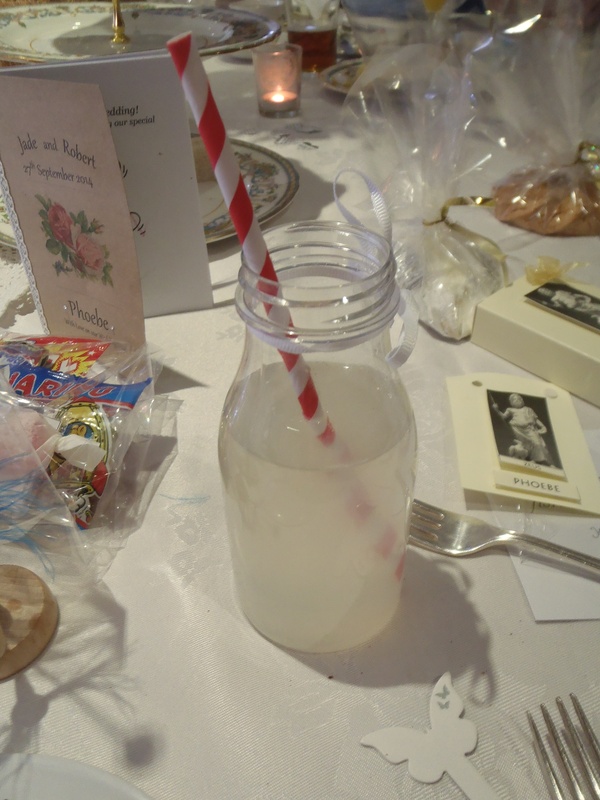 The children were given glass milk bottles filled with lemonade and a traditional styled straw which added to the vintage feel. The speeches followed and unusually the bride also said a few words as she handed out gifts to the relevant people of the bridal party. It was lovely that they gave gifts to both the fathers and the mothers rather than just the traditional mother’s gift. The father of the bride speech had clearly taken quite some preparation as he talked about the history of the ‘Baines’ name and that of the ‘Michaelides’. 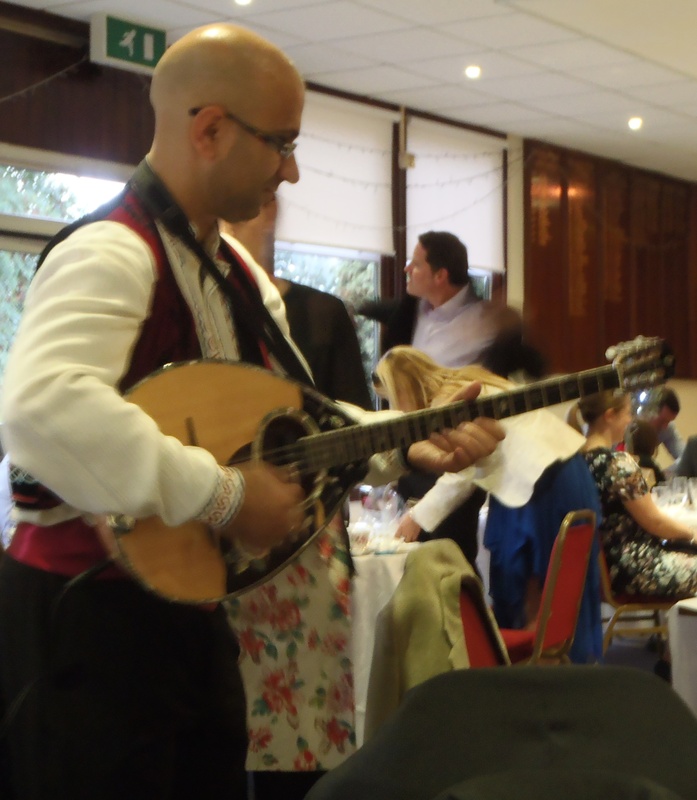 The tables were then pushed aside and a Greek band arrived. Everyone had an opportunity to take part in the dancing and we were particularly amused by a dance the lead musician got my brother and his best man (my Dad) to do. 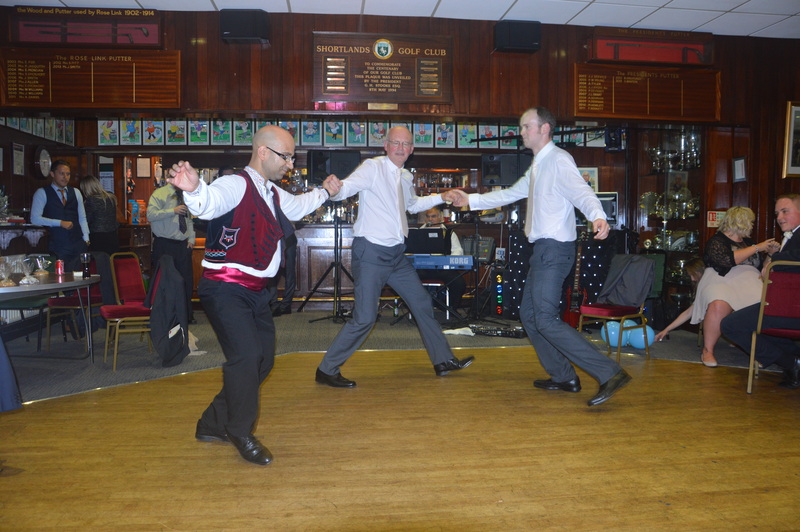 Then it was time for the Greek money dance. 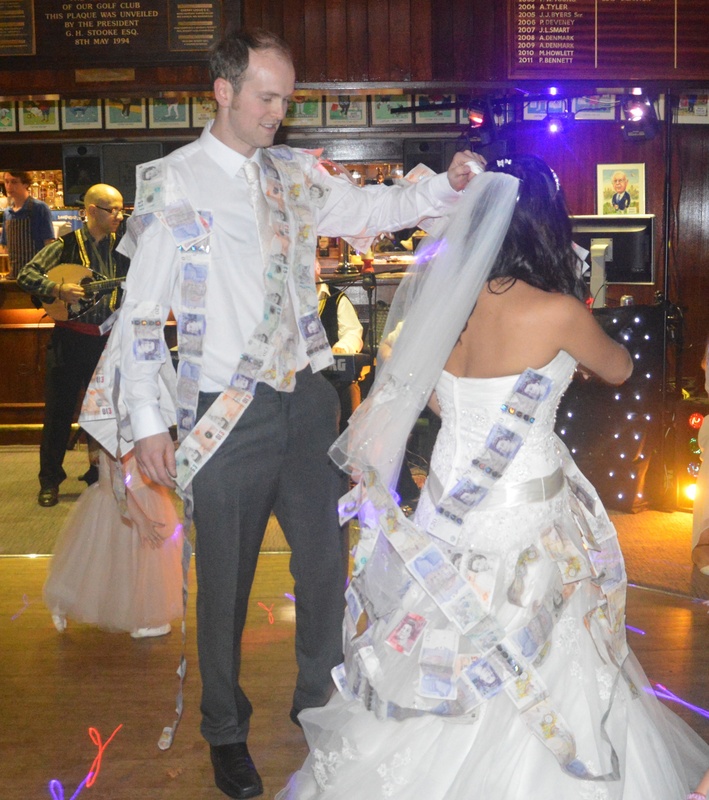 It is traditional for the bride and groom to hold a handkerchief between them and guests take it in turns, pinning an equal amount of money on both the bride and groom. 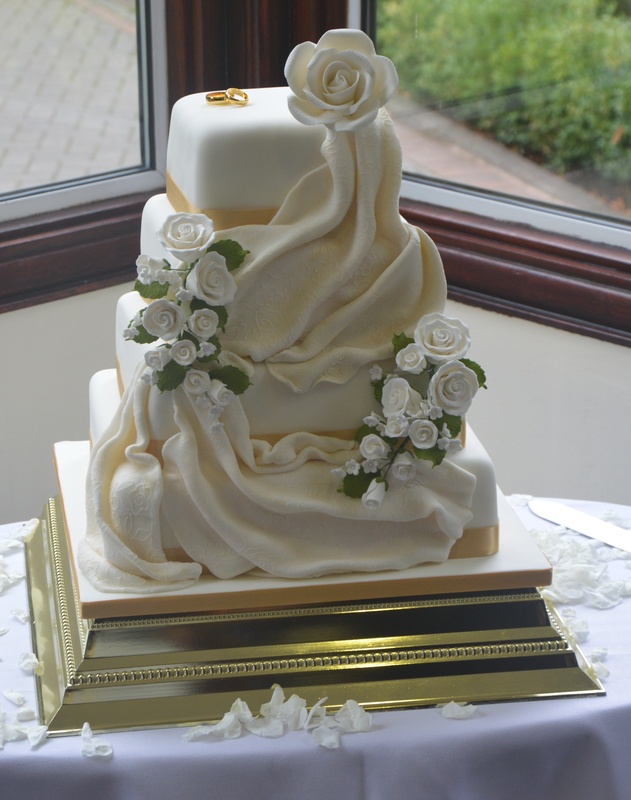 The cake was cut which had been made by my Auntie and had cream roses and a kind of drape that to me resembled the traditional Greek robe. Then the couple enjoyed their first dance to ‘Everything’ by Michael Bauble – a favourite of Jade’s. 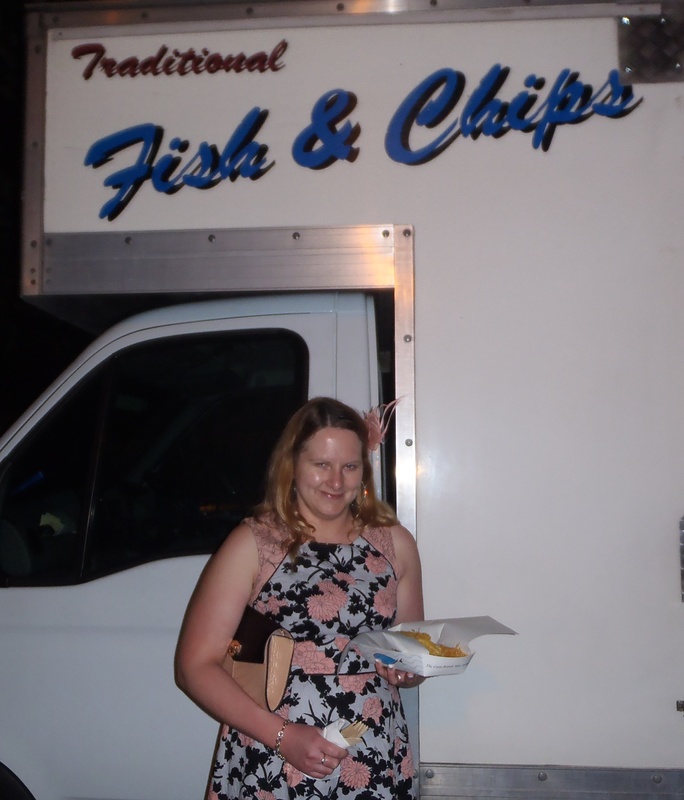 After the traditional Greek music there was a DJ and a fish and chip van came to provide the evening food which was a lovely novel idea. 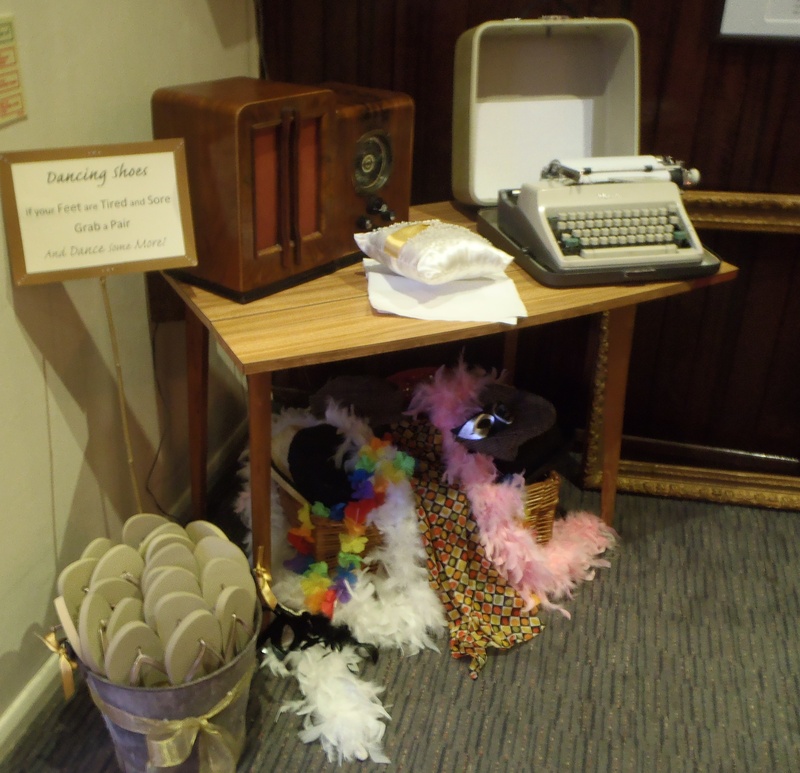 The couple really had thought of everything and provided a bucket of gold flip flops for tired dancing feet which I have not seen done before. At the end of the evening, my husband and I left for the train station, both a little the worse for wear and staggering along with one of the olive trees that I was given as a thank you for doing the reading – we must have looked a sight! The day was so quirky and unique and it was abundantly clear just how much effort each of them had put into the day. It shows that even when the budget is modest, a wonderful day can be achieved. Jade and Rob make a lovely couple and I wish them a lifetime of happiness. 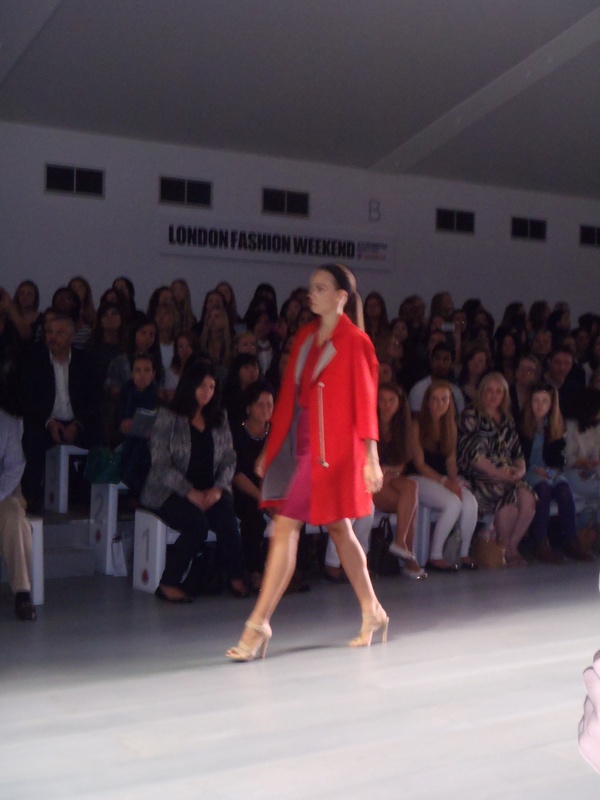 In September I attended London Fashion Weekend at Somerset House with a friend. 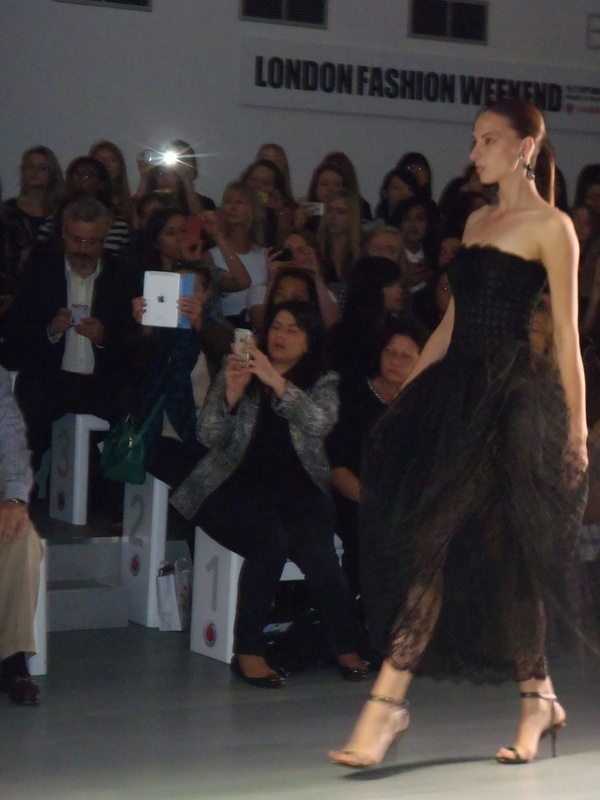 It was the second year I had been and is a great opportunity for anyone to experience the excitement of the exclusive fashion week that proceeds it, attended by over 5000 press and buyers. 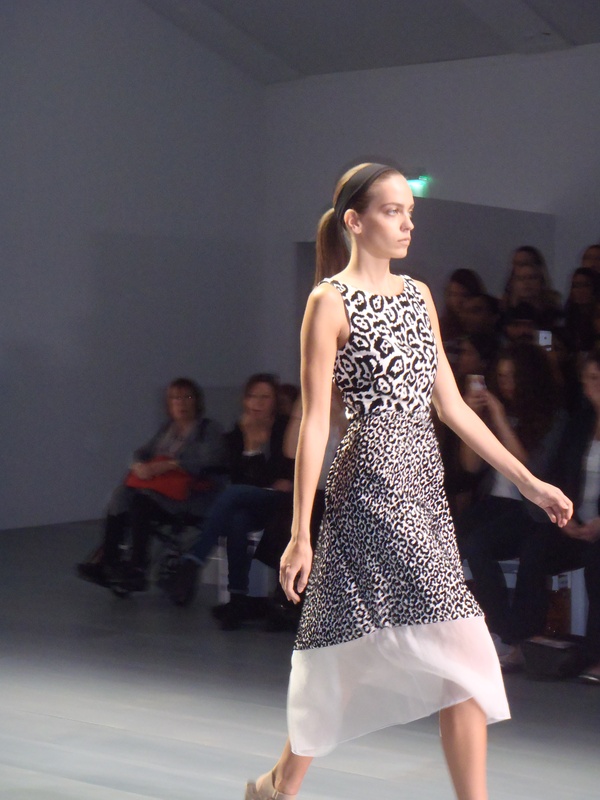 There are trend and designer catwalk shows. 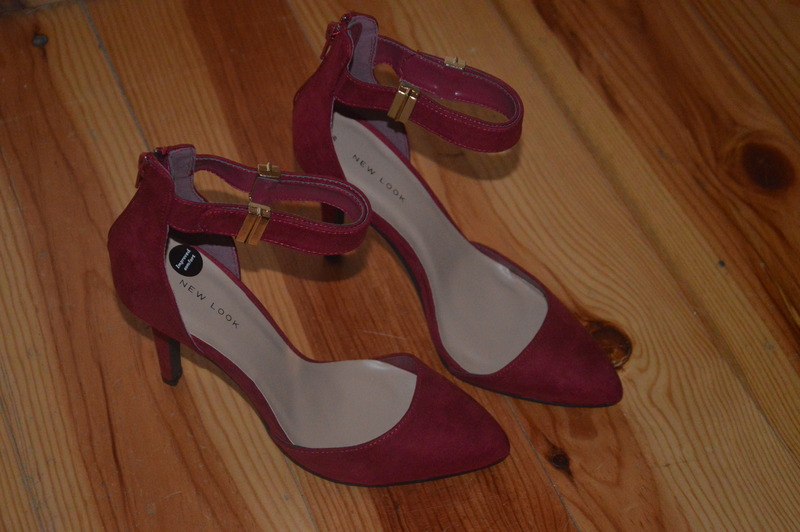 We attended the trend show which was presented by Angela Scanlon, the presenter, fashion writer and stylist. 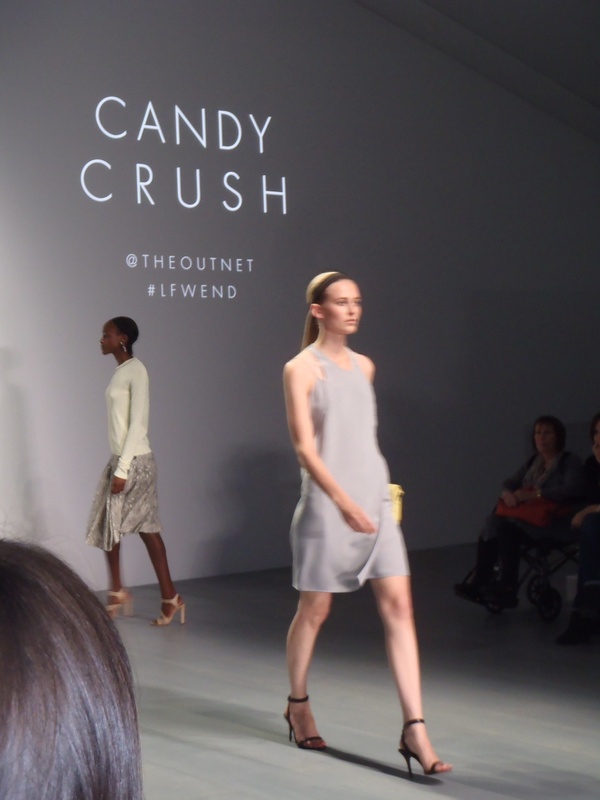 The trend show was styled by the outnet.com, founded in 2009 by the NET-A-PORTER group and selling over 250 designers at up to 75% off. We arrived early to join the queue and managed to get second row seats for the catwalk show. The first trend was ‘One and Only’ and this trend explores wearing colour head to toe and mixing textures such as velvet and leather. Then it was ‘Candy Crush’ – no longer do pastel shades have to be exclusive to summer – this trend shows how to work it into your autumn/winter wardrobe. 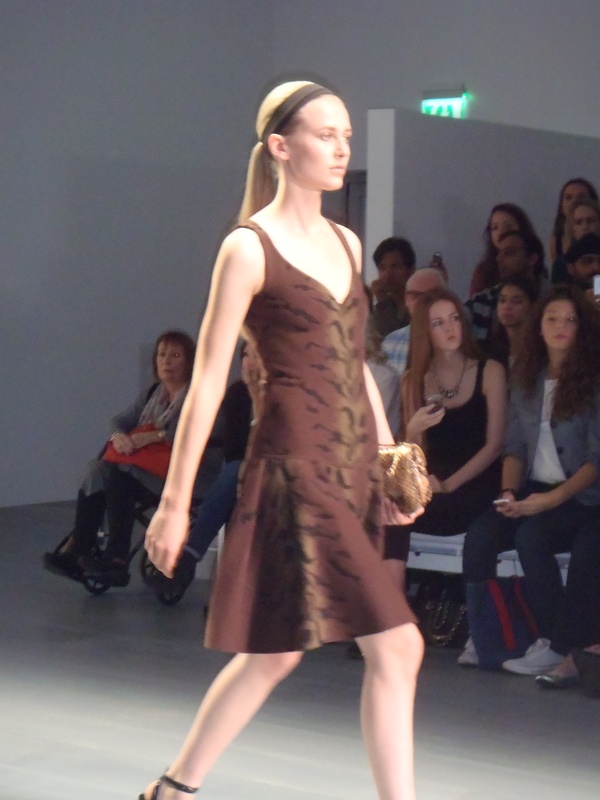 Next up was ‘Jungle Fever’ embracing all sorts of animal prints, some more subtle than others and earthy tones. The final trend was probably my favourite ‘Fairytale’. Designers have taken inspiration from their favourite fairytales and experimented with chiffon, lace and embellishment. The cape seems to be the coat to go for again this winter. 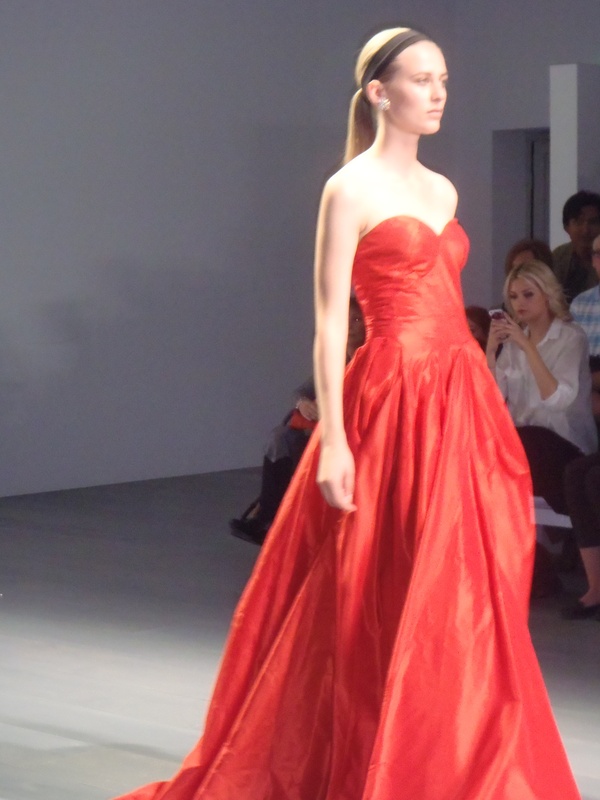 The show closed with a stunning red dress by Oscar de la Renta. Hair for the show was styled by Toni&Guy and Make up was by Maybelline. The hair trend was the slick backed ponytail. Lulu Guinness who was presented an OBE in 2006; celebrates 25 years of design this year so it seemed fitting that the free tote bag this year was designed by her. Lips have long been her trade mark with a special edition silver lips clutch being released for her anniversary but this year it’s all about hands. The bag was full of some great goodies including an Essie nail varnish and a Maybelline mascara. 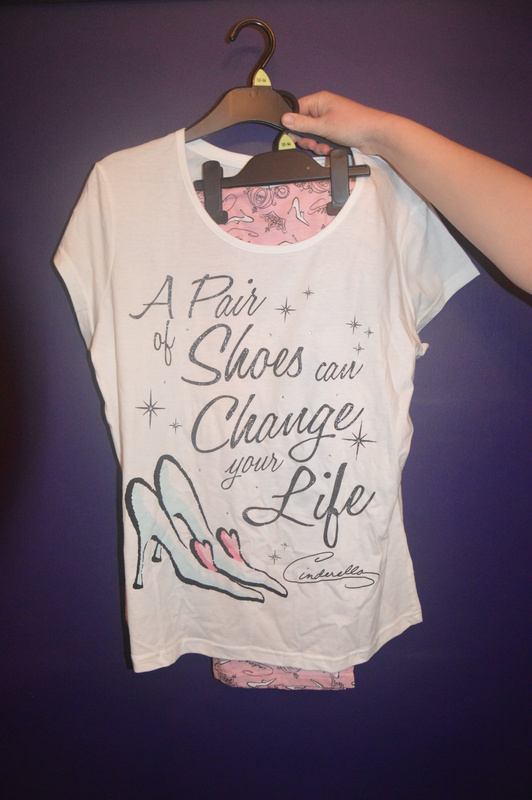 Speaking of the fairytale theme – I couldn’t resist these cinderella pyjamas – they were simply made for me. 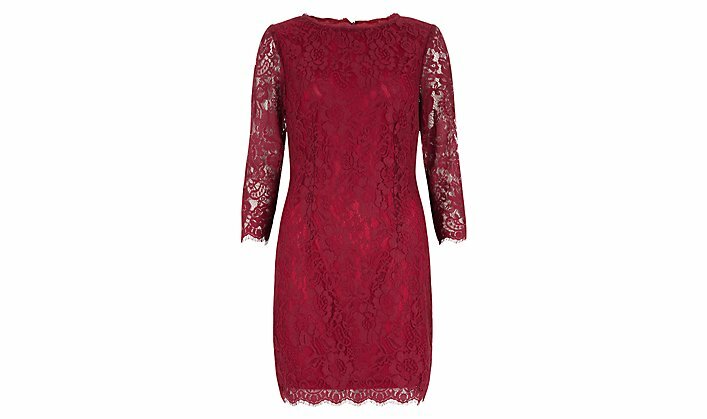 Some of my first autumn purchases took inspiration from both one and only and fairytale – a burgundy lace dress from New Look and some burgundy suede shoes also from New Look. Now the weather is getting cooler it will soon be time to invest in some cosy knitwear and possibly a new coat. Don’t you just love a new season? Happy shopping!